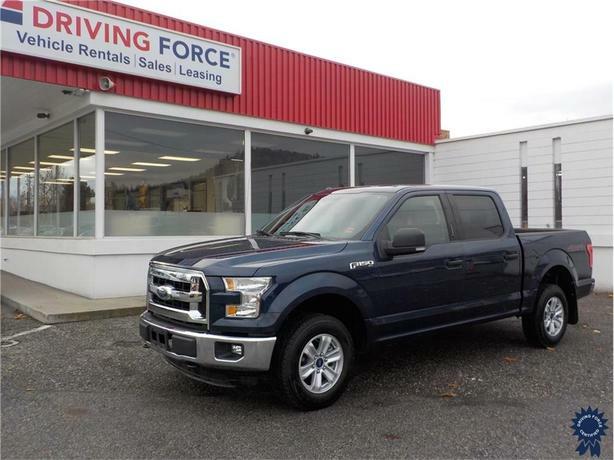 This 2015 Ford F-150 XLT Supercrew 6 Passenger 4X4 5.5-Foot Short Box Truck comes with a 145-inch wheelbase, electronic 6-speed automatic transmission, electronic-locking with 3.55 axle ratio, 17-inch silver painted aluminum wheels, blue jeans metallic exterior color, medium earth grey cloth 40/20/40 split front bench seat, trailer tow package, Class IV trailer hitch receiver, integrated trailer brake controller, skid plates, dual power glass heated sideview mirrors, rear window fixed privacy glass, rear window defroster, SYNC with MyFord Touch, all-weather rubber floor mats, rear view camera, 155-amp alternator, towing with harness and trailer sway control, front fog lamps, deep tinted glass, remote keyless entry, power door locks, three 12V DC power outlets, keypad entry, low tire pressure warning system, auto locking hubs, 87.1-litre fuel tank, and 1,600 lbs Maximum Payload. The 5.0-litre V8 gas engine provides 385 horsepower at 5,750 RPM and 387 lb-ft of torque at 3,850 RPM. Touch base with us to discuss purchasing or financing options that are right for you and experience the difference you will only find at DRIVING FORCE Vehicle Rentals, Sales and Leasing.